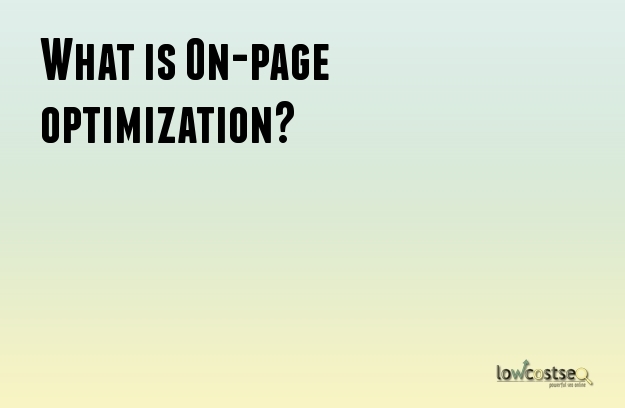 What is the importance of On-page Optimization? The title tag is one of the most crucial website optimization element. The title tag should be descriptive for your visitors to help identify your website and business. The first thing we see on the search engines is the title tag so naturally, we have to give high importance to it. It has to be appealing for it to be seen on the search engine and rank better than thousands of similar sites like yours. Meta tags may not be regarded as important as they used to be, however, Meta Description is something that cannot be ignored at all cost. The Meta description should have a brief description of your website while focusing on the services that you provide. It acts as a selling snipper, whereby when a user finds it appealing he is more likely to click and go to your page to read or find out more information. One issue is if your Meta Description is too generic and not much thought process has gone into writing it then there is a good chance that your site will be ignored completely. It is very important to highlight particular parts or areas of your website that you want the audience to look at. There is a provision in that there are many tags in HTML which allows you to do so. For example - the header tags [h1][h2][h3], Bold [strong], Italic [em] etc. The text inside your header tags is given very high importance by the search engine. In most cases, they are used to define the page/post titles or the important sections of your site. Some websites have lots of images and if your site is one of them then you need to optimize them too as they cannot be read by search engines. Humans can easily see and interpret the meaning but the search engines simply cannot do this. The Search engines spiders can only read the text but not images hence you require to use special tags for your images in order to give them meaning. There are many methods to optimize your website to get the best rank in the search engines. One of the more important ones is a suitably optimized webpage. Of course, webpage optimization is only a part of SEO. It is, nonetheless an important one. There are a few elements that need consideration while optimizing your webpage. The webpage should provide some value to the visitor. The content of the web page should be original and valuable apart from its promotional aspect. Try to ensure that your webpage content is better than that of your competitors. Suitable additions to increase the value would be multimedia components such as images. Visitors are unlikely to leave if the webpage offers them good value. User experience has become more important than ever when it comes to attracting new and old visitors. The elements of navigation and content should be easily understandable. The design needs to be aesthetic and of a high quality. It should be suitable for the image of your company as well. The layout of the page should be such that it is easy to scan through them for information. The important parts of the content should be highlighted to make the process easier. There should be the very little delay when it comes to loading and rendering the page. It should be responsive as well. Social networks have become quite important in recent days in SEO. The URL should be descriptive enough to make the topic of the webpage obvious to the reader. Attach options and buttons to make it easier for the visitor to share the webpage. The webpage should have content that is worth sharing. People no longer use computers only to visit websites and web pages. They are not limited to a single browser either. Ensure that your webpage can be rendered in the correct fashion in all the popular browsers at least. It should also be thoroughly optimized so that it fits in various screen sizes. There should not be any difference in the URL of the webpage when it is accessed through different devices. Keywords are an irreplaceable part of SEO. A single webpage should be meant for single search intent and the related keywords and variations. The primary keyword or phrase should appear among the first few words of the title. It is possible to implement the most important keyword or key phrase in the URL of the page. The content should be logical and easily understood. Related keywords should be used if the exact one cannot be implemented. Highlighting measures are required for the keywords. The images in the web pages should have the appropriate keywords in their alt tags. The anchor text used should be descriptive in nature. Secondary keywords need to be used logically and appropriately. There are many such tips which can be used for getting the optimization process perfect for your webpage. A suitably optimized webpage can boost the conversion rates quite significantly. If you want to optimize your web site or blog in the search engines, you should be aware of two methods, the on-page optimization and off-page optimization. On-page optimization is very different from onsite SEO optimization. In the on-page optimization technique, the content of the site is optimized for the keywords. This is an all comprehensive process and includes placement of the keywords, headings, quality of the content and so on. The best on-page optimization tricks that can help you secure high rank for your web site are as follows. This is a very important on page factor and it will help you secure high ranking on the web site. It is essential to place the right keywords on the title. It is better if the keywords can be placed on the front. The title length is also important. It must not cross 65 characters inclusive of spaces. If all the rules are followed then the page ranking can surely increase. This is basically moving forward with the optimized URL structure. Here also you can use the chosen keywords at the beginning of the URL of the blog post. You should not use any special characters in it like commas, colons, symbols or brackets. The URL should only consist of alphabets as well as numerical from 0 to 9. You can include dashes to separate the strings of URLs. Follow only the permalinks if you want good results. Keyword density is very important if you want to get the good ranking on the search engine. The density should not 1.5% in the content. Remember to use the keyword in the first paragraph and also the last one. Do not forget to highlight the important phrases and keywords so that it stands out. Short articles are not very good for getting good ranking. Research shows that blogs with few words do not fare very well on the search engines. You should write articles of minimum 700 words if you want to create an impact. Do not write shallow articles, but research well and include as much information as you can in the articles. Write naturally, targeting your audience and do not make it mechanical for the sake of search engines. This is another trick that works really well. You can link your blog posts to the others blog of similar topics or ideas. This interlinking can will help in improvement of the traffic. However, you have to make sure to link to only quality blogs and not random posts as this may harm your web site’s credibility. Do not go for sites that are not trusted by Google. At the end of the day none of your SEO efforts will show any colors, if your content is not engaging or exciting. The viewers need to get attracted to the post enough to complete reading the entire thing. If the bounce rate increases, it will impact your web site negatively on Google.